Bill Griffeth, longtime genealogy buff, takes a DNA test that has an unexpected outcome: "If the results were correct, it meant that the family tree I had spent years documenting was not my own." Bill undertakes a quest to solve the mystery of his origins, which shakes his sense of identity. As he takes us on his journey, we learn about choices made by his ancestors, parents, and others, and we see Bill measure and weigh his own difficult choices as he confronts the past. 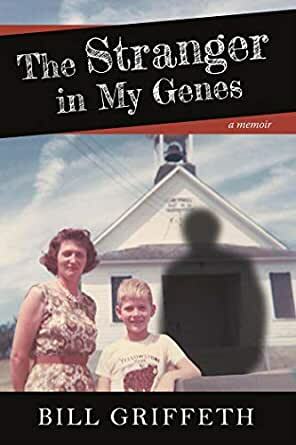 A gripping memoir.--Emily Sweeney "Boston Globe"
"A courageous personal account, The Stranger in My Genes brings science and genealogy together in a powerful story of family secrets. Bill Griffeth has infused his passion for the unfettered truth into riveting revelation. I couldn't put it down." --Mary Tedesco, co-host of Genealogy Roadshow "Boston Globe"
5.0 out of 5 starsWell told. Great insight. Compelling read. A well written insightful story that reveals a great deal about the human psyche and how we cope with "belonging". Clearly told, with great reflection, regarding the author's discovery that his dad wasn't his biological father. Quite moving. The story deals with the struggle the author had following the surprise revelation following a DNA test, and how he goes about learning about his newly discovered bio father, all while attempting to be considerate of his 95 year old mother's feelings. A wonderful "human" story. Thoroughly enjoyed it. 4.0 out of 5 starsOnly the beginning; stop being codependent; do you really want to know? I read about this book before it came out. I was excited to read it. I read it straight through at one sitting. As an adoptee who reunited on my maternal side 33 years ago and still seeking my paternal side, I was constantly frustrated with the author. I understand he was stunned, disappointed, grieving and considerate of other peoples feelings. However, I found it exasperating that he didn't actually look at the genetic information right in front on him. He gave a distant cousin a flippant response instead of realizing that a real live person can provide so much more information than geneology records, pictures and locations of relatives. He imagines what a Father's day would be like if he actually got to spend it with his biofather. However, he has an opportunity to communicate, make a connection and possibly a relationship with his siblings and other paternal relatives but he cops out instead. It seemed like a codependent response and doesn't even give anyone else the opportunity to make a choice for themself. Furthermore he is concerned about his Mother's feelings and reputation but writes this book which reveals her "secret" to the world! He never even asks her if it was an ongoing relationship or affair or even if it was consensual! Sorry Mr. Griffeth, you are just at the tip of the iceberg imho of knowing where you came from and who you are! Do more than use your imagination! Take a leap of faith and find out what your paternal family is really all about! Furthermore, you mention how much you enjoy your relationship with your cousin, Doug, who was relinquished and reunited! You are NOT even giving anyone in your paternal family the opportunity to have this with you! I started reading this wonderful memoir and had to put my life on hold until I reached the end. As an avid genealogist myself I love the way the various strands of the family story are woven together. I wept with empathy and laughed at the twists and turns. Highly recommended! I could not put this book down. I felt the turmoil and pain, the love and compassion, and ultimately, the acceptance that while one truly never knows what curve balls life will casually toss your way.... that there are treasures to be found, if you choose to look. I was extremely moved by your journey, Bill. You've done your family...all of them...proud. As a genealogist I found this book fascinating .Good for him to pursue the question. As a nurse I helped with the conception of many children through the use of donor sperm. I wonder how many of their parents fear that DNA will unveil their family secret if they made it so. Thanks to Ancestry an 87 year old cousin who recently found out her aunt was really her mother found me, and was able to fill in family history on the father she never knew.